We welcome listings from western performers, cowboy poets, musicians, singers and songwriters. We'll introduce your talents to our global Cowboylife audience. Each listing includes a description and a link to your website. Baxter Black - "Baxter Black can shoe a horse, string a bob wire fence and bang out a Bob Wills classic on his flat-top guitar. Cowboy poet, ex-veterinarian and sorry team roper, he has more hair around his lip than on his head. Raised in New Mexico, he spent his workin' life in the mountain west tormenting cows. Now Baxter lives in Arizona and travels the country tormenting cowboys." Ben Crane - "From the Alberta ranchlands just east of Rocky Mountain House, comes western country singer Ben Crane. His love for the west country and the outdoors comes through not only in his music, but in his artwork as well. The western cartoonist and Leanin' Tree artist says "What I do beats the hang out of a real job! Ben performs at a variety of functions from gatherings and festivals, to private and corporate functions, from county fairs to churches, and just about anything in between." Butch Falk - Butch sings, and records, the songs of the working cowboy. 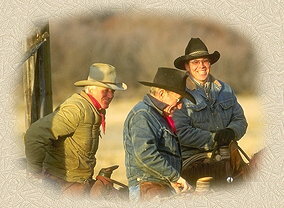 Quite often written by real working cowboys themselves, or people with a direct connection to them, they are songs of inspiration, good and hard times, as well as songs of understanding. Nominated for the AWA Rising Star Award in '98, and nominated in 1999 & 2000 for Male Vocalist of the Year, Butch has performed all over western Canada and the U.S including the Cowboys Heroes & Friends Western Festival in Branson. Mike Puhallo Cowboy Poet - Mike was a working cowboy, a saddle bronc rider, a packer and horse trainer. He ranched in partnership with his younger brother, as well as writing and painting western oils. Mike's poetry still reaches out and touch western people where they live, through the experiences and feelings that are shared by those who live close to the land. The reason his poetry is so "real" is simple; this cowboy had "bin there an' done that".